Metro Atlanta's newest Burger 21 restaurant plans to open Monday February 6th in Kennesaw Marketplace. 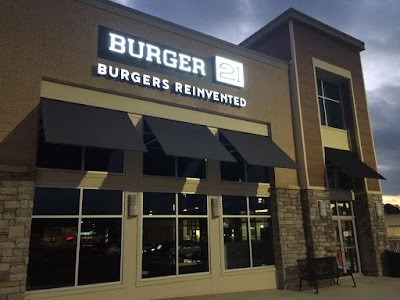 The Tampa based chain has existing Atlanta area locations in Kennesaw, Buckhead and Buford by the Mall of Georgia. A Snellville location "temporarily closed" this past August after three months in business, but has yet to reopen. The new Kennesaw unit sports a new logo for the brand and two Coca-Cola Freestyle units. Budi's Sushi recently opened in the former Bento Hut in the shops at the Pencil Factory Lofts on Decatur Street downtown. As the name suggests, the eatery specializes in sushi, but it also features assorted other Asian fare. The space was previously home to Chow Bing, which continues to operate its popular Buckhead location. Cook Out is now open on Cobb Parkway across from the Big Chicken. The North Carolina based chain now has over 20 locations open in Georgia with new restaurants planned for Warner Robins, Winder and Macon. The Big Chicken in Marietta closed earlier this week for what the franchise owner anticipates will be a twelve-week renovation. Plans include added a screened-in outdoor patio, gift shop and the latest KFC branding. The restaurant was built in 1956 as part of Johnny Reb's Chick, Chuck and Shake. The "Big Chicken" was added to the restaurant in 1963, and was fabricated by Atlantic Steel, the steel mill located where Atlantic Station is today. The restaurant changed hands in the mid 70s at which time it became a KFC franchise. Rodney's Jamaican Soul Food has reopened in their new location on Cobb Parkway. The Jamaican eatery, which celebrated its seventh anniversary earlier last year, relocated from a space near the intersection of Cobb Parkway and Windy Hill to the former D. Geller & Son in Cumberland Square North shopping center. Metro Atlanta's second Rockler store opened this past Saturday at Town Center Plaza in Kennesaw. The woodworking retailer has an existing store on Roswell Road in Sandy Springs in Sandy Springs Plaza. The new store will celebrate its Grand Opening next Saturday, February 4th. The new Local Republic restaurant opened this past Monday on North Perry Street in downtown Lawrenceville. I first wrote about the planed relocation in August 2015 with renovations of the two level restaurant having taken longer than expected. Papi's Cuban & Caribbean Grill plans to open their new restaurant at Emory Point on Monday January 30th. The new Papi's is the chain's seventh, joining locations in Tucker, Midtown, Stockbridge, Kennesaw, Lawrenceville and at Concourse T of Hartsfield-Jackson Atlanta International Airport. The Emory Point location replaces the former Bonefish Grill. Chow Baby, which opened this past October in a street level space at Alpharetta Lofts on Canton Street in Alpharetta, has closed. The restaurant, which celebrated its Grand Opening in early November, quietly closed sometime last month. Given its short life, it's unfortunately safe to say the restaurant was "coming soon" for longer than it was open. Abercrombie & Fitch plans to soon begin a significant renovation of its Lenox Square store. The renovation, which permits filed with the City of Atlanta reflect will run nearly $2 million, follow sibling concept Hollister's renovation at Lenox last year. Industry sources indicate the Lenox Square store will be among the first in the company to receive the new look. This will mark the most significant renovation of the store since it relocated to the former FAO Schwarz from Phipps Plaza over ten years ago. Also at Lenox Square, Sweet Hut Bakery & Cafe plans to open a new 436 square foot location in the Fashion Cafe in April. The new shop will open in the former at&t shop space that had most recently housed an independent sock retailer. Sweet Hut has existing locations in Doraville, Midtown and Duluth, and has upcoming locations in Kennesaw and Plano, TX. The owners of Sweet Hut also plans to open a new restaurant, Food Terminal, later this year in Chamblee. The new Asian eatery will occupy its own building in the City Farmers Market shopping center. Roll It Up Ice Cream, yet another "rolled ice cream" business, plans to open in Asian Square, home to the original Sweet Hut. Freddy's Frozen Custard & Steakburgers plans to open their ninth Georgia restaurant February 23rd in West Cobb. The new restaurant will open in a newly constructed freestanding building in the new Parkside West Cobb shopping center. The center, anchored by Sprouts Farmers Market (which opened today), is located on Dallas Highway, adjacent to the Avenue West Cobb. Tafa's restaurant, a Mediterranean restaurant located on Magnolia Street in Roswell, announced earlier this week via its Facebook page that it plans to close this coming Saturday, January 28th. Frontgate plans to relocate and expand its Phipps Plaza store. The home furnishings and gift retailer currently occupies a second floor space of about 10,600 square feet. (The space was for many years The Peasant Uptown.) Frontgate plans to relocate later this fall to a new 19,615 square foot space in the Nordstrom wing. The new store will reportedly encompass the former Coldwater Creek, Ross-Simon, Barami and as well as Vera Bradley, which plans to close this weekend. Greeting card, stationery and related products retailer Papyrus plans to open a new 1,242 square foot store on the first floor of Phipps Plaza later this spring. The space, previously home to retailer K-la, will be in addition to the company's existing store on the second floor of Lenox Square near Bloomingdale's. Bella's Best, born as an online venture in 2006 and later expanded to a brick and mortar location on Bennett Street in 2015, is coming back! The Bennett Street location closed early last year with plans to reopen in East Cobb a short time later. The East Cobb relocation never happened and instead the owners opted to relocate elsewhere intown. Renovations to their new organic bakery cafe space are wrapping up and I'm told the restaurant should be open "in a couple weeks." The Bella's Best will replace what was previously Flora Dora, a home decor shop, on Cheshire Bridge Road. The freestanding yellow building sits at 1830 Cheshire Bridge Road, between Las Margaritas and Nakato. In addition to the food component, the new space will serve as an art gallery, catering operation and event space. 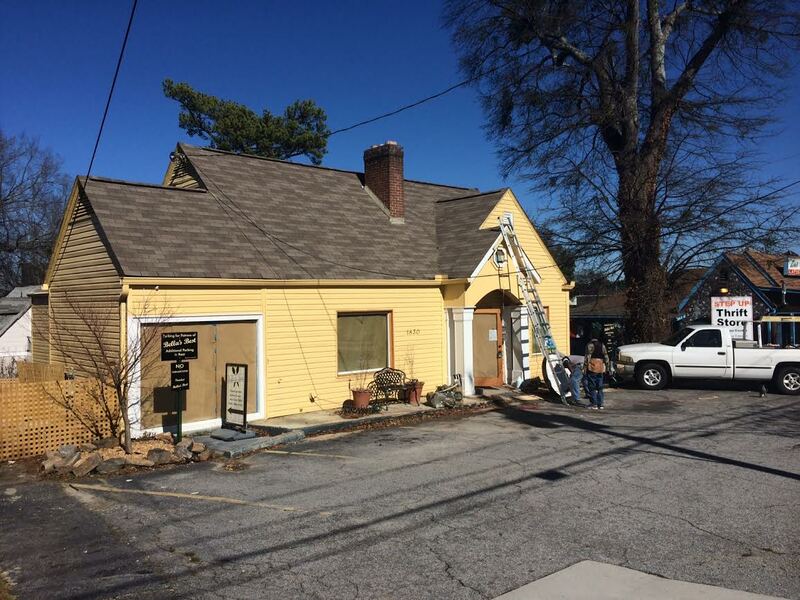 Jerusalem Bakery has officially moved to their new location in Marietta. Previously located at 585 Franklin Road, the Mediterranean restaurant and bakery relocated to a larger space at 1175 Franklin Gateway last week. The new space was previously various auto businesses but was completely renovated to serve as the restaurant's new home. About a mile separates the new and the old locations with the new training complex for the Atlanta United FC situated on Franklin Road between the two. Yesterday's News: Shula's 347 Grill seems to have very quietly closed on Lenox Road in Buckhead. The closure reportedly happened over five months ago but seems to have gone unnoticed by many. The restaurant opened in 2009 in what was then the newly christened Atlanta Marriott Buckhead Hotel & Conference Center. The boring lenox road bar & grill is now the onsite restaurant. Just fyi, unless you mean that Papyrus is staying still, the word is 'stationery'. Common mistake, but figured you'd like to correct it anyway. Does anyone know what's being built at the former Sonic Drive-in site at 215 Cobb pkwy? Sad that Vera Bradley is closing but not surprised. There are so many online places to buy Vera Bradley. It was one of the places I would go to Phipps for though. Remember eating at Johnny Reb's and going to House of 10,000 Picture Frames in Marietta. Another cookout???? Yawn....GROSS. THEY CHARGE TOO MUCH FOR THEIR SMOOSHED GROSS BURGERS. AND THEIR BILLBOARDS ARE AN EYE SOAR. on another note. Glad to hear the Big Cicken is getting a facelift.